UNITED NATIONS, December 3 -- While at the UN public speakers Thursday tried to put the Wikileaks scandal behind them, UN officials more quietly told Inner City Press of their concerns. While the UN ostensibly reports to all 192 member states, there are initiatives undertaken by the Executive Office of the Secretary General which are mandated neither by the Security Council nor the General Assembly. 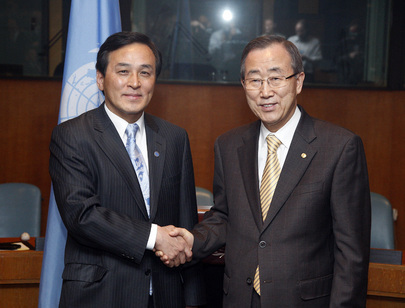 Ban Ki-moon for example has a particular interest in the Korean peninsula. Early in his term, Inner City Press obtained a copy of an internal memo about how the UN should use its “advantage” to become a central player on the peninsula. Later Ban's senior advisor Kim Won-soo, among with UN political chief Lynn Pascoe, went to North Korea and provided a cursory readout upon their return. More recently, a document emerged about an upcoming December 6 Policy Committee meeting about the Korean Peninsula. When Inner City Press asked about it, Ban's acting Deputy Spokesman Farhan Haq said the memo had somehow not been seen by any senior Ban administration official. Just as he has refused to provide Inner City Press with any requested information about the frequent flyer miles retained by Ban, Pascoe and USG Alain Le Roy, Haq refused to answer if a meeting would still take place on December 6. Several officials and diplomats used Ban's Korean initiatives as an example of something a state might “want to spy on,” even “legitimately” as one UN official put it. As to why Ban has not fought back more strenuously against the directive signed by US Secretary of State Hillary Clinton that his and UN Under Secretaries Generals', SRSGs' and force commanders' e-mail passwords and frequent flyer miles account numbers be collected, it was pointed out to Inner City Press from UN sources that under Ban's Chief Information Technology Officer Mr. Choi, these officials believe that all of their communications and computers are surveilled by the Ban administration. One well placed official asked rhetorically, “How can Ban complain about being spied on if he is spying himself?” Watch this site.